I've successfully installed an OSM tileserver following the switch2osm tutorial and using the OSM-Bright style. All the labels are in the country original language, but I need my server to be able to serve tiles in differents languages, depending of the current user locale, falling back to English or country language if the name is not found in his locale. How do I do that? I've seen some posts relative to internationalization, talking about a "name:en" column in the planet_osm_point table, but I don't have it in my db (although I used the --hstore option with osm2pgsql). Is that normal? You have the names in your tags column if you used the --hstore option. It is therefore possible to change your SELECT statements from something like e.g. which would then, in this example, prefer a Finnish name if set, then the English name, then the international name, an then the local name. You have to make separate copies of your style for every language you wish to support, and set up separate URLs. Since you are producing raster tiles where labels are inseparatable from other content, you will need separate tile caches for each style, and you will want to pre-render each style on low zoom levels too. This is only practicable if you are supporting a small number of languages. If you want to be able to support "any language", you will have to change your approach altogether and use a vector tile based solution. Thanks Frederik. It works, I was trying to access it with the column name "name:fr"... I didn't understand this thing at all. I need to support 6 languages (including english) but it could increase in the future. If vector tiles is not a lot more complicated, I'll probably go for that if it allows me to have a more evolutive server. But is the osm-bright style compatible with vector tiles? And do you have a link to a tutorial like switch2osm to learn how to use vector tiles please? We've considered openmaptiles.org but we are looking for a less expensive solution, that's why we're making our own server. I'm not sure I'll be able to write any tutorial about the subject, it looks really more complicated to setup and I'll probably don't have the time to do this :) If 6 languages is ok to serve with raster tiles, I think it's better if we stay with that. The whole openmaptiles.org stack is available as Open Source and you can install it yourselves like the raster tile stack. Using COALESCE give me some strange results : I'm requesting some Paris tiles in french, so for that I'm doing COALESCE(tags->'name:fr', tags->'name:en', tags->'int_name', name). 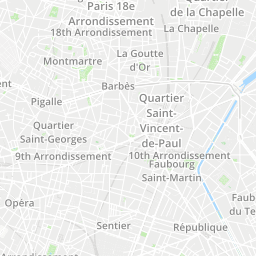 But as you can see on the picture below, it sometimes shows both english and french names (like "Paris 18e Arrondissement" is the french name, and "18th Arrondissement" the english name). Most likely you have a place=suburb node with a French name and boundary=adminsitrative polygon without, or vice versa. The doubling of place names can be a problem even when you're not playing with languages. It is possible to analyse the situation in SQL and decide not to render a label in certain cases, but not easy and makes rendering slower. Yes it is possible to have different rendering rules depending on where in the world you are but this, also, slows down rendering a bit. See e.g. this SELECT statement in the old MapQuest style: https://github.com/MapQuest/MapQuest-Mapnik-Style/blob/updates2/mapquest_inc/layer-streetnames-eu.xml.inc#L569-L587 - combine this with an SQL CASE statement and you could do something that prefers name over name:en in France, but name:en over name in China. Actually the problem is bigger than expected, some of the Paris suburbs have a name:fr, some other have not. So even if I keep only these ones, I still have a problem because the names aren't always in the same language. The link was meant as an illustration of how you have to do it basically, not something you can just copy and it works. Basically you need a table that contains the outlines of areas for which you want to have special casing, and then you need to join the OSM feature table with that table on geometry to find out which of your areas of interest the feature is in. You could generate that area-of-interest table from your existing planet_osm_polygon by picking out the requisite admin_level=2 boundaries but you should definitely apply simplification to keep perfomance acceptable. Actually all area are of interest for us, we need to display the best name possible for all of our clients, depending on their language. It definitely looks a bit tricky so I'll probably look for another way to get over this issue. Thanks for your help! Actually the problem is bigger than expected, some of the Paris suburbs have a name:fr, some other have not. You can always pre-process the data so that (for example) within the area of France "name:fr" is always populated with something (from "name "if "name:fr" was blank). As an example, this script is part of the process to create the maps behind this map, and on there "name:cy", "name:en" or "name:gd" will be used as "name" depending on location. You may actually want to do the reverse of that (set "name" to "name:fr" in a defined area) but the principle is the same. Thanks SomeoneElse it looks great, I'll try that!